Books are amazing. That probably goes without me saying it since I'm writing this on my own little book blog, but it's worth repeating now and again. Books are amazing. Not only can I visit, say, Paris in the, say, 19th century, but I can suddenly and without warning care about something I wouldn't normally care about. Take dogs, for example. Yes, dogs. When I was a kid, I was scared of many of them and found their constant slobbering, licking, jumping, and barking indescribably annoying. Now that I'm an adult, I'm scared of some of them, and I still find their constant slobbering, licking, jumping, and barking indescribably annoying. (I know I'm in the minority here, so don't hate me, all you dog lovers out there!) 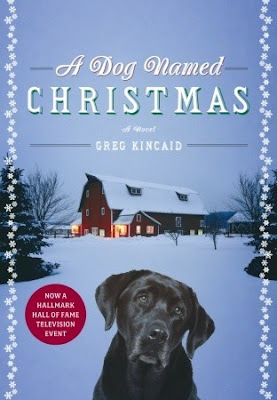 But while I was listening to this book, for a brief few hours in time, I was totally wrapped up in the story of one dog, to the point that if Todd (a character in the story) had called me up right then, I think I would have agreed to adopt a dog for Christmas. That's the power of words right there. The story is narrated by George, a middle-aged father of five whose youngest son, Todd, still lives at home. Todd is warm-hearted and kind with a passion for animals and painting their barn all colors of the rainbow. Although an adult, Todd has some developmental challenges which keep him from venturing out on his own. One December, he hears about the animal shelter's program to adopt a dog for Christmas. Todd becomes fixated on this one idea and won't let it rest until George agrees to let him bring home a dog for a week. Before long, Todd has extended his plan and sets out to make sure all the dogs at the shelter have somewhere to go for Christmas. Meanwhile, having a dog around brings back some painful memories for George, memories that he has kept hidden away for many years. Finally, he is able to confront his past and feel at peace. A few years ago, Hallmark made a movie based on this book. I watched it with my family last year and liked it so much that I decided to read the book this year. For the most part, the movie followed the book really closely, and I like both for different reasons. As my dad was saying to me, and which I agree with, in the movie you feel like Todd is the main character, and in the book, it seems like George is. I loved the maturity Todd gains in the movie (and which is definitely present in the book), and I loved the way Todd and Christmas (the dog) and the family all facilitate George's healing in the book (which is also present in the movie). Todd is a great character. The author never attaches a name to what is different about Todd (but it seems like it's something somewhere on the autism spectrum), and I loved this. It made it so that I didn't attach any expectations to Todd; I just got to know him as I would anybody else. I also loved Todd because I know people like him, and I love them. I think Todd perfectly embodied the things I love about my loved ones, which is in part summed up in this one quote: "Before you knew it, his urgent need became your urgent need." I love the enthusiasm that is so infectious with these types of people. The story takes place in a very small town, and maybe some of you remember that I also grew up in a very small town. In addition to the fact that both towns only have one stoplight, I felt like there were so many other little similarities that the author could have been using my hometown as a model for the town in the book. I can see Todd and his family being involved in community events and driving down the dirt street in their old pickup. Their brightly colored, mismatched house would fit in just right. This is a sweet, simple Christmas story. I would read it again, no question. Oh sounds lovely. I can't believe I haven't seen the movie. I'm totally wishing I could see the house now. I'm off to search for it.